The official death toll from violent protests in Cameroon this week has risen to 17 as troops attempt to restore order in the capital, Yaounde. Barricades were erected in Yaounde, youths fought police in the port of Douala and three deaths were reported in the north-western town of Bamenda. President Paul Biya has accused his political rivals of orchestrating the unrest to depose him. The opposition says the rising cost of food and fuel is causing the protests. President Biya has vowed to use all legal means to end the violence, which the opposition believes may have caused many more deaths than those reported officially. What started as a nationwide transport strike in protest at fuel costs has turned into a series of anti-government demonstrations, BBC West Africa correspondent Will Ross says. In Bamenda, mobs of angry young men turned up at boarding schools and demanded that the students join the demonstrators on the streets. The principal of the Presbyterian Secondary School, Rev Henry Fomuso, said they carried crude weapons like sticks and rocks and held bottles of petrol as they threatened to burn down the school. After negotiating with the mob, the teachers managed to ensure the girls and young boys were allowed to stay but around 200 teenage boys were taken away, possibly to be used as human shields during confrontations with the police. This scene was repeated at several boarding schools. After a few hours most of the students had made it back to the schools or to their parents' homes but not all the children are yet accounted for. 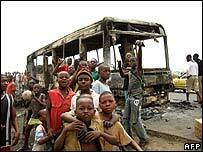 It seems the boarding schools were targeted because they educate the children of the Cameroonian elite and the disgruntled youths, many of whom see little prospect of finding work, wanted to make a point about the inequality that exists in Cameroon, our correspondent says. One of the dead in Bamenda is believed to be a teenage boy, who was shot dead. Both Yaounde and Douala were both virtually brought to a standstill on Thursday despite a heavy military deployment. On Wednesday night, President Biya appeared on state television and accused the opposition of being behind the violence. Having come to power 25 years ago, he recently introduced the idea of amending the constitution so that he can stand in the next election. Opposition groups have been calling for protests to stop the amendment happening. John Fru Ndi of the opposition Social Democratic Front denied being behind the unrest but said he could understand the frustrations felt by Cameroonians because of the high cost of living. "The people have no other alternative than to express themselves by marching on the streets," he told the BBC's Network Africa programme. 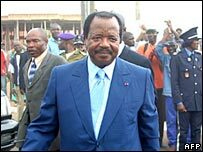 Our correspondent adds that Cameroon is home to more than 100 different ethnic groups, and keeping the country relatively stable has been one of the major achievements of President Biya's 25 years in office. The violent scenes across the country this week are a sign that the population is becoming increasingly frustrated in what is one of the most corrupt countries in Africa, he says.